Lee Ann is pleased to announce her latest recording on Audible. She is Evil! 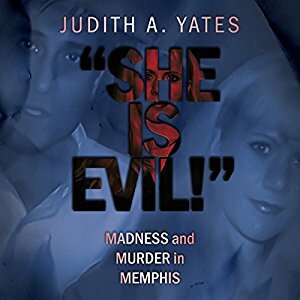 Madness and Murder in Memphis by Judith A. Yates follows the story behind the brutal murder of Ejaz Ahmad by Leah Joy Ward. “That woman is evil. She is evil!” — Ejaz Ahmad. “Ejaz Ahmad was handsome, charismatic, and a self-made businessman. He arrived in the United States from Pakistan determined to fulfill his mother’s dying wish: to come to America, complete his education, and make his mark in the world. Settling in Memphis, Tennessee, Ejaz became owner of several businesses, father to a handsome boy, and a devout Muslim. The only thing missing in his life was a wife, someone special to protect, honor, and love. Leah Ward was a pretty girl, but a prison parolee with a history of drug charges, petty crime, and a questionable past. She led a flotsam life, drifting from town to city to state. When she was introduced to Ejaz Ahmad, she believed she had found the ultimate answer: a place to live, someone to take care of her, and money to spend. But what began idyllic soon became abusive and then dangerous for Ejaz. His friends and family warned him. And in May of 2003, Ejaz paid the ultimate price when family members found his mutilated body in a shed. This book was published by Wildblue Press and can be purchased from Audible here. Posted by lahowlett on September 18, 2017 in Uncategorized and tagged Audible, audiobooks, Ejaz Ahmad, Judith A. Yates, Leah Joy Ward, murder, nonfiction, true crime, Wildblue Press.